This page is about an area of the Himalayas along or near to the Bhutan-Tibet border. A Japanese sketch map is shown here, based on modern Chinese military mapping. But despite the respective 7538m and 7570m elevations shown on this map, the most commonly quoted elevations of the two main summits are 7554m for Kula Kangri, and 7541m for Kangkar Punsum. All authorities have KP on the political border, but most authorities extend this border as far east as KK, then switching back south-west to KP before continuing eastwards. Bhutanese government websites include a map which shows this border and a document which claims Kula Kangri (7554m) as its national high point. This border and HP are disputed by Chinese and some other authorities, who claim that the border does not extend to within 15km of KK, and that KK is wholly in Tibet. This page supports the latter point of view. According to Eberhard Jurgalski, "the first Western researcher in Bhutan was Professor Augusto Gansser, beginning back in the 1960's. He published many articles in the Berge der Welt (Mountain World) series of the Swiss Foundation of Alpine Research, where he explained names and also the border to Tibet. In a book called The Geology of the Bhutan Himalaya (Basel 1983, ISBN 3-7643-1371-4) he summarized his knowledge. All the time he claimed Kangkar P�nzum as the highest peak in Bhutan, even if Kula Kangri was higher. It is 20 km within Tibet. I saw only on later commercial maps, that the border was more to the North." Eberhard continues: "On a peak list published in Die Alpen in 1972, Dyhrenfurth listed "K�nla Khari" (7554 m), Kangkar P�nzum I (7541 m), KP II (7532 m) and KP III (7516 m)." These elevations are the most widely quoted today, although the former is generally called Kula Kangri. But "then, in 1980, Toni Hiebeler's book Himalaya and Karakorum was published. On page 197 he supplied the names K�nla Khari I to IV". These have been reproduced as several Kula Kangri's by some authorities, but to the best of our knowledge there is nothing correctly named Kula Kangri in the KP area. "Then, in High magazine #186 (May 1998), on page 23, a Japanese book Mountains of the Himalayas by Yoshimi Yakushi was mentioned, with new heights for many peaks on the Bhutan-Tibet border. Yakushi used most recent (but for us restricted) survey maps from the Chinese military." The above mentioned sketch map is from this book. On the border course, it seems that there has been no formal agreement between China and Bhutan. In this situation, there will be divergence of views. For my part, While I can accept our tendency to support the position of Bhutan in preference to that of its much larger neighbour, I will not allow that tendency to prejudice my conclusions. I argue that Kula Kangri belongs exclusively to Tibet. Nobody lives in the disputed area, so political considerations are irrelevant; therefore I argue that the most logical course for the border is along the watershed divide. In the past, the course of the divide was unclear, but now SRTM data, shown on this color relief map, clearly shows that the divide passes well to the south of Kula Kangri, which lies on a north-eastern spur. The SRTM void areas have been fixed for clarity, but the course of the divide is indisputable. Consequently Bhutan's claim that Kula Kangri is its high point should be rejected, whatever the relative elevations of KP and KK. And, despite what the Bhutanese websites and commercial maps may indicate, authorities with detailed topographical knowledge of this area tend to take this view. Large scale commercial maps draw the border east to KK, then south west to KP, then east again, but I challenge any critics to re-draw a logical border on the relief map in this manner. 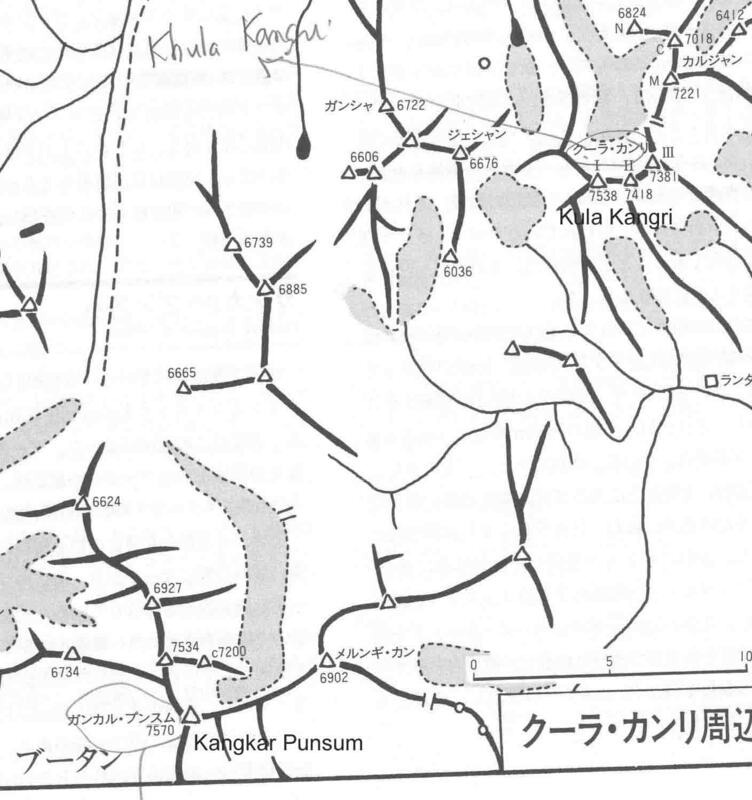 It is also worth noting that, if the border drawn on Bhutanese and commercial maps were correct, the Japanese expedition documented here would have had to pass through Bhutanese territory. If Bhutan were really serious about their border claim then the Japanese would have been uable or unwilling to do this. On the elevations, the modern Chinese survey would have had much better access to these summits than the older surveys on which the most commonly published information is based. That Japanese authorities, which also include the May 2003 Alpine News book by Tamotsu Nakamura (p84), publish the new elevations gives them additional credibility, and Eberhard comes down firmly in support of them. To the best of my knowledge, Bhutan has not surveyed this area. However, the possibility that these elevations have been manipulated for political ends cannot be discounted. Each time an authority reproduces Bhutan's "7554m Kula Kangri" high point, it implicitly recognises the Bhutanese drawn border. There is no proof that the new elevation of 7570m for Kangkar Punsum, which is an undisputed border summit, was not stretched by the Chinese military to counter the above process. I think that it is now up to Bhutan to conduct or permit its own survey. Bhutan may lack the resources, but it has plenty of friends in the international community who would be willing to survey these summits on the same aid terms as the Finns surveyed Nepal. I remain open to persuasion, and respect that others may take a different view. But at present, despite the fact that the old elevations are quoted by more authorities, I come down on the side of the new Chinese elevations, i.e. that Bhutan's high point is Kangkar Punsum, 7570m, and that, regardless of its location with respect to the political border, Kula Kangri is lower at 7538m. It is interesting, and rather odd, that the Guide to Mountaineering in China does not mention Kangkar Punsum at all. This may be related to the border dispute. Footnote 1: In deference to the wishes of the King of Bhutan, Kangkar Punsum had never been climbed and is claimed as the world's highest unclimbed mountain. A 1999 Japanese expedition reached its north top, also known as Liangkang Kangri, but did not continue to its main summit. Footnote 2: German authorities refer to "Kangkar P�nzum". This is the correct transliteration into German. Footnote 3: A few authorities publish an elevation of 7239m for KP. The main ridge is SRTM void, but I found two SRTM cells, elevations 7065m and 6712m, 2km apart, on either side of the main ridge and separated by a direction perpendicular to the main ridge. So an HP of 7239m would seem to be incompatible with the steepness of the ridge and faces as shown in the photographs accessible through the link below. (Comparison: two 550m elevations, 1km apart, lie on either side of a 900m part of Scotland's Skye Cuillin ridge). Also if the 7239m elevation were correct it is very unlikely that 7570m would have been published by Japanese authorities. The 7239m elevation looks like the fiction of supporters of Bhutan's territorial claim; they believe (incorrectly, see above) that this claim would be strengthened if it were believed that Kula Kangri is considerably higher. Link: http://gangkhar-puensum.iqnaut.net/. Several further links, which include photographs of Kangkar Punsum, are supplied at the foot of this article. The summit elevations on this trekking map are wildly inaccurate and should be completely ignored. The pass elevations are better. Information collated by Jonathan de Ferranti, from information supplied by Grant Hutchison and Eberhard Jurgalski. Last update 19 September 2005.